With the introduction of Anti-Gambling laws in the early 1900s, now illegal but still vastly popular slot machines had to remain underground for more than two decades. The development of technology enabled slots to come out of the closet and new generation of modern slots was introduced. First slot machines with electric motors were introduced in 1934. These were the horserace console slot machines named "Paces Races", where the electric motor moved the bellows and the rest - moving the horses, spinning the reels, calculation and distribution of the payout - was fully pneumatic. In 1963 Bally Manufacturing introduced the first entirely electromechanical slot machine named "Money Honey". It offered bottomless hopper and fully automatic slots payouts system with no need for attendance. Side lever became a rudiment. 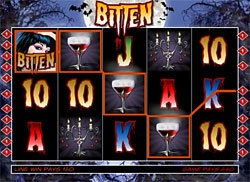 The whole set of special sound and visual effects were now available in the modern slots. In 1964 Nevada Electronics released the 21 slot machine. It offered chairs for up to four players. From this time it becomes impossible to cheat the slot machine without mechanical parts like it was with slot machines in the past. The size of modern slots reduced. The vast popularity of new electronic slot machines resulted in the development of ever more sophisticated slots models using microchips or random number generators. In 1975 the first video slot machine called "Fortune Coin" was invented. It didn't gain much popularity at first, though, due to certain mistrust from the players who could not see the reels spinning. Nevertheless, the electronic slot history went on. International Game Technology (IGT) that bought Fortune Coin in 1976 developed video slots technologies to the new level, which caused the increasing popularity of new video slots in Las Vegas casinos. In 1982 IGT introduced brand new progressive video slot machines called Megabucks. Small jackpots were now eliminated. Megabucks machines were linked in each casino, which made possible progressive multi-million $ jackpots, and offered additional bonus games. Megabucks gained vast popularity among the gamers and initiated the development of the newest generation of modern slots that are used in casinos nowadays. 1994 Australian "Three Bags Full" and 1996 American "Reel 'Em In" slots offered a bonus round on a "second screen", both allowing extra games with additional payouts that could be either won at once or accumulated to the total jackpot. Today slot machines come in a whole set of different variations, from video slots to different number of reels and games based on game shows or movie and cartoon characters. Slots are manufactured by a variety of companies, from the above mentioned International Game Technology to Sigma Gaming and Atronic etc. Popular Nickel slot machines manufactured in Australia allow making multi-coin bets on different possible outcomes. Modern slots using payment tickets with barcodes on them have also gained popularity due to the fact that coins are not needed in slots any more. Nevertheless, many players still prefer the classical slot machine models of the past, that's why casinos offer all varieties of slots to suit all tastes.